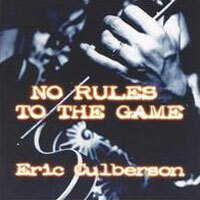 Eric Culberson’s second studio release under the Kingsnake Records label. No Rules To The Game features thirteen tunes, of which eleven are original compositions, and has been met with critical acclaim by noteworthy music publications including Blues Revue, Living Blues and Real Blues Magazine. A virtual tour de force of fret-burning guitar work, No Rules just might be the album that vaults Eric Culberson into the national spotlight. Complemented by a soulful horn section and a stable of seasoned King Snake session players, Culberson’s energy is palpable as he demonstrates equal skill on both electric and slide guitar. He has developed a mature Texas-meets-Chicago sound that generates sparks without being overwrought or flashy. And most promising of all, there isn’t a weak cut on the entire album. – Excerpt from an interview with Eric Culberson by Ken Hohman of Blues Revue Magazine. Read the whole interview here. 7. Why Did You Lie?